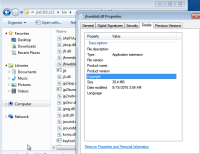 Description: jfxwebkit.dll is not signed from 8u112 bundles. Not observed from 8u111. 3. find the file jfxwebkit.dll, right click open "Properties", go to "Details" tab, check the version and signed information. Expect: The file is proper signed and with correct version infor. Actual: The files is not signed and without version info. Please check attached screenshot for details. Product(s) tested: 8u112 windows bundles. Test result on the last GAed release for this train: Pass. 8u102 b14 promoted bundle doesn't have this issue. Is it a platform specific issue: Yes. Windows only.